HP just recently launched its new Firmware release, the 4.01 – for its Blade Interconnect darling, the Virtual Connect. You can find the release notes here. Also noteworthy are the cookbooks, and HP just released its “Dual-Hop FCoE with HP Virtual Connect modules Cookbook” . One of the new features is dual-hop FCoE. What this means is that until so far you had only one hop FCoE from Virtual Connect to the server Converged Network Adaptor (CNA). This facilitates quite a lot FCoE implementation, since you don’t need any of the DCB protocols – its only one hop. Starting from version 4.01 you can now have an uplink connection where you pass FCoE traffic. 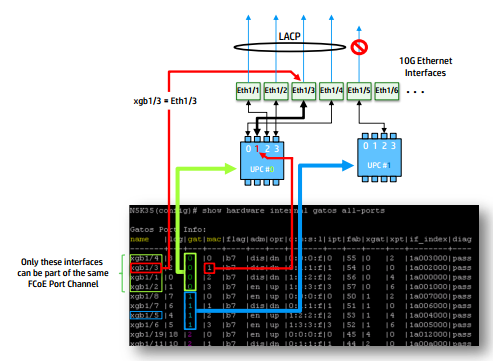 The VC serves thus as a FIP-snooping device and the upstream switch as Fiber Channel Forwarder (FCF), in case you want to have retrocompatibility with former existing FCP environments. Please note that only a dual-hop topology is supported. You cannot continue hopping FCoE traffic accross your Network. Well you can, but its just not supported. 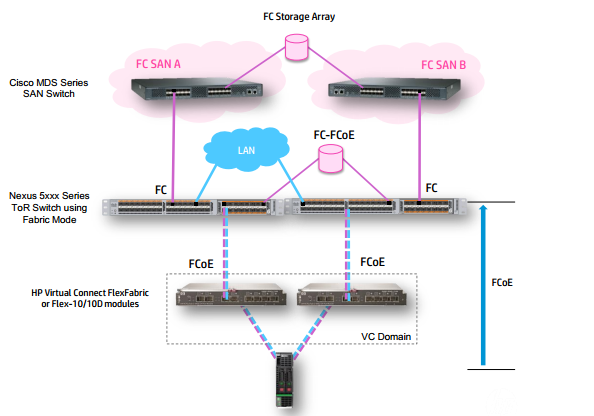 On HP side, only VC FlexFabric (FF) and Flex10/10D are able to do dual-hop FCoE. On Cisco’s side, only Nexus 5500 and 5000 (NX-OS version 5.2(1)N1(3)) are supported. Cross-Connect links between VC uplinks to Nexus are not supported. 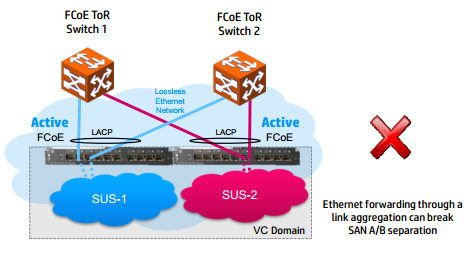 Even if you’re using vPC, it will be a design violation of traffic mix in SAN A (say connected to Nexus 01) and SAN B (say connected to Nexus 02). Moreover, if you want to converge all traffic on the same uplink LAG ports, you will have to have a single Shared Uplink Set (SUS) per VC. 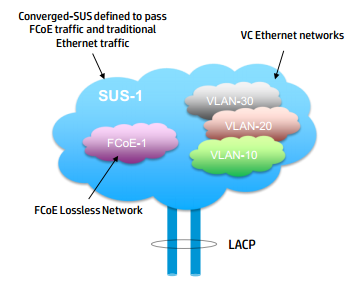 Note that this SUS can only have one FCoE Network. However, if you have more uplink portson your VCs available, then consider seperating Ethernet traffic from Ethernet traffic, using SUS for Ethernet, and a vNet for the FCoE traffic. 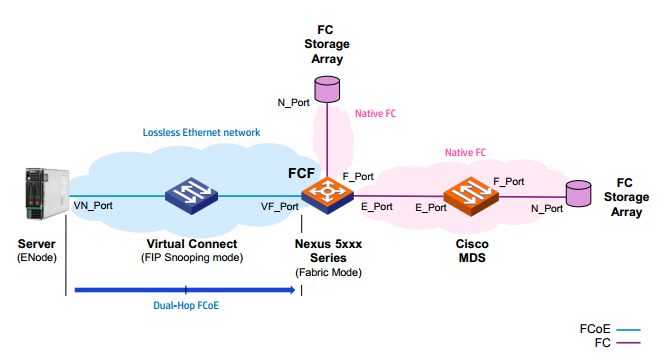 So in this scenario, and when using vPC on the Nexus it is still advisable to cross-connect VC SUS Uplinks from the same VC Module to different Nexus for pure Ethernet traffic. Note: Remember VC rules. You assign uplinks from one VC module to one SUS and uplinks from anotherdifferent VC module to the other SUS. 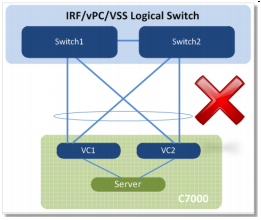 It is very important that you get this right, as VC modules are not capable of doing IRF withemselves (yet). More on how setup VC with IRF here. So when using port-channels on VC FCoE ports, you will need to configure ports on the Nexus to belong to the same Unified Port Controller (UPC) ASIC. Nexus 5010/5020 support a maximum of 4 ports when carrying FCoE traffic, 5548/5596 a maximum of 8. More on the VC setup and installation “HP Virtual Connect for c-Class BladeSystem Version 4.01 User Guide” here. Really useful and nicely explained !! !